Imagine fun stories alongside the magical ruler of Equestria with this sparkling Princess Celestia pony figure! 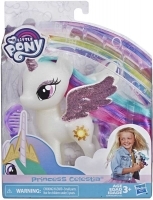 This pony figure has a beautiful horn and wings that sparkle and shine with glitter! Kids can use the included comb accessory to brush her long, colourful hair. 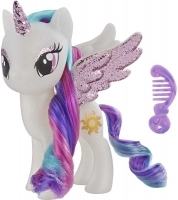 Princess Celestia is an alicorn princess, meaning she is a pony with Pegasus wings and a unicorn horn. Princess Celestia figure is a white pony with a long blue mane and colourful tail, inspired by the look of Princess Celestia in the My Little Pony Friendship is Magic television series. 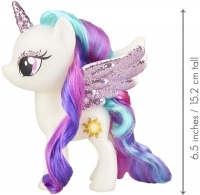 Her colourful hair and glittery features give the regal Princess Celestia a magical look. Princess Celestia and her sister, Princess Luna, are the co-rulers of Equestria. Together, they use their magic to raise the sun at dawn and bring out the moon each night. Look for sparkling Princess Luna pony figure to imagine the sisters are together on a magical adventure!